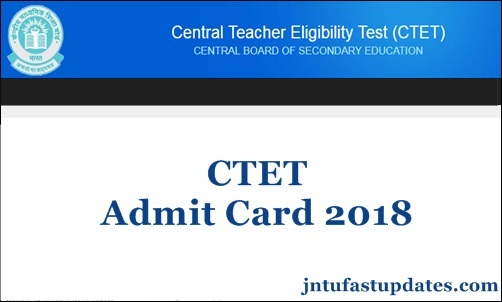 CTET Admit Card 2018 Download: Central Board of Secondary Education (CBSE) will be organize the Central Teacher Eligibility Test (CTET) examination on 9th December 2018 for Paper 1 and Paper 2. Lakhs of aspirants have applied for the CTET examination this year. The examination will be held at various examination centers across India. All the hopefuls applied for the CTET examination can download CTET Hall ticket from the official website, ctet.nic.in. This examination will be held in 92 cities across India. Candidates who are going to take part in the CTET examination will have to download CTET Admit Card as a must. The admit card/hall ticket is the most important document to carry to the examination. The examination officers will not let the competitors proceed with the examination without showing the hall ticket. Hence download and carry the hall ticket while going to the examination. Central Board of Secondary Education annually conducts the Central Teacher Eligibility Test (CTET) examination for the aspirants seeking to become primary and secondary school teachers can apply for CTET Examination in the announced dates. Candidates with Senior Secondary or its equivalent education can apply for CBSE CTET Primary Teacher (Class I to V ) and candidates with Graduate Degree can apply for Elementary Stage ( Class VI to VIII) Exam. Candidates those who have qualified in CTET Examination will not get direct employment. CTET qualified candidates can apply for Teacher Posts in various govt schools. Candidates having the essential qualification can apply for both CTET Paper – I and Paper -II, Both the Paper-I and Paper-II examinations will be held on the same day at two different timings. The CTET examination for Paper 1 and Paper 2 will be held on 16th September 2018. The CTET Hall ticket 2018 will be accessible to download from 20th August 2018. This year more than 8 lakhs of candidates are expected to compete for CTET examination. All the hopefuls who are going to appear for the CTET examination are hereby informed to download the hall tickets from the CTET official portal and preserve the hall tickets safe to carry to the examination. Candidates can download CTET Hall ticket for Paper 1 and Paper 2 from 20th August onwards. Do not forget to carry the admit cards while going to the examination. On the hall ticket, the CBSE board prints the information of examination center, date and timings of the examination along with the candidate’s roll number, DOB, Signature, scanned photograph and other details. So, all the hopefuls can go through the admit cards clearly once to check all the details. Applicants who are going to clash for the CTET examination must carry the CTET Hall ticket and any other valid identity proof copy to the examination hall. Candidate’s identity verification will be done by the examination officers. Project the documents at the time of verification. Take after the following steps to download CTET Hall ticket for Paper 1 and Paper 2. The candidates may download Admit Card from CTET official website and appear for the examination at the given Centre. In case of any discrepancy noticed in admit card regarding particulars of candidate, photograph and signature or any other information vary from confirmation page, he/she may immediately contact CTET unit for necessary corrections. In case confirmation page is not generated after depositing the requisite fees, the candidate should approach the Assistant Secretary (Exam. ), CTET Unit, CBSE between 10:00 A.M. to 5:00 P.M. from 30-08-2018 to 04-09-2018 along with proof of payment of fee i.e. candidate copy of E-Challan, if payment made through E-Challan or copy of bank statement, if payment made through Credit/Debit Card for considering his/her candidature for CTET – 2018 examination. The candidates shall report at the Examination Centre 90 minutes before the commencement of the examination. Candidate report at the examination centre after 9:30 AM shall not be allowed to sit in Paper II and candidate report after 2:00 PM shall not be allowed to sit in Paper I. The candidates are advised to read the instructions on the admit card carefully and follow them during the conduct of the examination. On the homepage, CTET Hall ticket for paper 1 /Paper 2 link will appear. Click on the link and furnish the required details such as register number, password etc. CBSE CTET 2018 Admit Card will get downloaded. Check all the details thoroughly from it. Take a printout of the CTET Admit Card 2018 and preserve it safe to carry to the examination.